LA's greatest hipster opens a store. For reals. The first retail space from notoriously divisive, sweetly nicknamed party/music photographer Mark "The Cobrasnake" Hunter, TCS's decked with shelves stocked w/ vintage-ness (including gear worn by Hunter himself), all in a pop-arted-out space w/ an ADD-addled setup of tube TVs playing old-school everything (from TMNT to Beavis & Butthead to Pong) and murals by Shepard Fairey, also the hurtful nickname given in shephard culture to the boy who cried wolf. Well-worn gear skews nostalgic/outlandish, w/ unique tees like a classic California Raisins "Heard it Through The Grapevine" number, a K-Ci and Jo Jo concert tee, and a Bart Simpson shirt that reads "Radical Dude", but not "New Radical Dude" because that guy's about as cool as Milhouse. 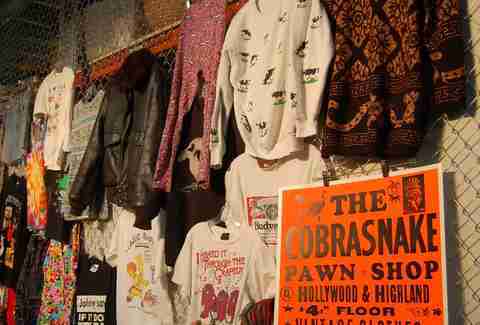 There's also non-tee vintage-ness (leather jackets, ugly sweaters, etc) as well as a small selection from Cobra friends, including upscale tees from Outline LA, limited edition gear from RVCA, steam-punk mewlery from Typewriter, and a "bootleg" gift set that includes a tote-bag, stickers, pins, and a coffee-table photo book with chapters featuring images of the store owner and his grandparents, which is almost as creepy as... wearing pins. 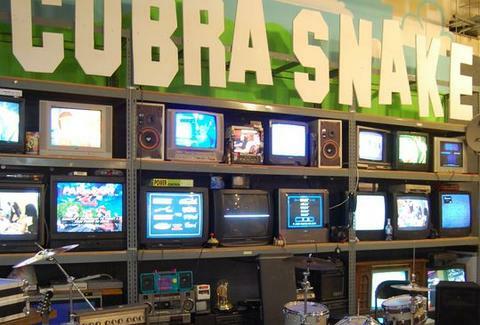 Cobrasnake's planning on throwing a slew of parties at the store, with movie screenings and live performances from bands, who tend to get a long way with just a cool name -- although if that's the case, why aren't we all listening to Space Hog right now?